Sheffield Steeldogs played host to the Slough Jets in the first meeting of the teams this season. Slough struck back with a powerplay goal of their own at 25.18 with Mindy Kieras converting a cross checking penalty on Steve Dumcombe. Edgars Bebris put Sheffield back ahead at 25.36 but Darius Pliskuaskas levelled the game at 25.55 and the second period ended 3-3. 12.09 of the final period went by before Ciaran Long netted the game winner, finishing from Cam McGiffin and after a Sheffield time out where Sedlar was pulled from the net Dan Scott made it safe with an empty net goal with just 13 seconds remaining. With just one game in the weekend again Slough stayed at home to entertain their nearest neighbours in their first competitive meeting of the season with the Bracknell Bees. Slough went into the game missing import defenceman Ladislav Harabin and netminder Gregg Rockman allowing 19 year old Danny Milton to make his first competitive start. Frantisek Bakrlik found the back of the net at 11.10 and just 74 seconds later Michael Wales scored making it 2-0 for the home team. Bakrlik found his scoring touch again at 17.45 to make it 3-0 and the home team enjoyed the first interval with a 3 goal lead. Bracknell pressed hard in the second period with Rob Lamey making it 3-1 after 2.18 and Jan Bendik made it 3-2 with a powerplay strike at 29.26. 13 seconds later Slough opened a two goal lead again when Dan Davies netted but at 30.16 the visitors pulled it back to a single goal margin through Alan Lack. Slava Koulikov caught a low moving Andy Munroe an left the game with 5+game for high sticks at 35.18 and the home team ended the second period penalty killing. After seeing out the remaining 18 seconds of Koulikov’s penalty Alex Barker scored the game winner on his former team at 42.04 opening the two goal margin again at 5-3 but Lukas Smital found the back of Slough’s net at 43.41 to make it 5-4 and keep the game alive. It was man of the match Bakrlik who scored the final goal of the game with his hat-trick strike at 47.57 and despite a late powerplay Bracknell failed to pull back into the game. Roman Szucs took charge of the game as the Basingstoke Arena played host to the first Bison vs Jets clash of the 2011/12 season. The home team fell foul of the referee first but killed off both penalties before Marcel Petran put them ahead at 6.53. The same player then converted a powerplay ay 9.13 to make it 2-0 but despite trading penalties and powerplays the score failed to change through the middle part of the first period. Aaron Connolly netted Slough’s first at 16.55 and Adam Calder pulled the game level with 1.47 left to play in the opening period. Basingstoke Captain Nicky Chinn put them back ahead at 23.08 but Calder netted his second of the night, this one a powerplay strike at 25.13. Within 58 seconds Jacob Heron had scored to give the home team a 4-3 lead and his goal was quickly followed at 28.35 by a Daniel Volrab strike on the powerplay. Petran then completed his hat-trick at 30.09 with another powerplay strike and the home team enjoyed a 6-3 lead. 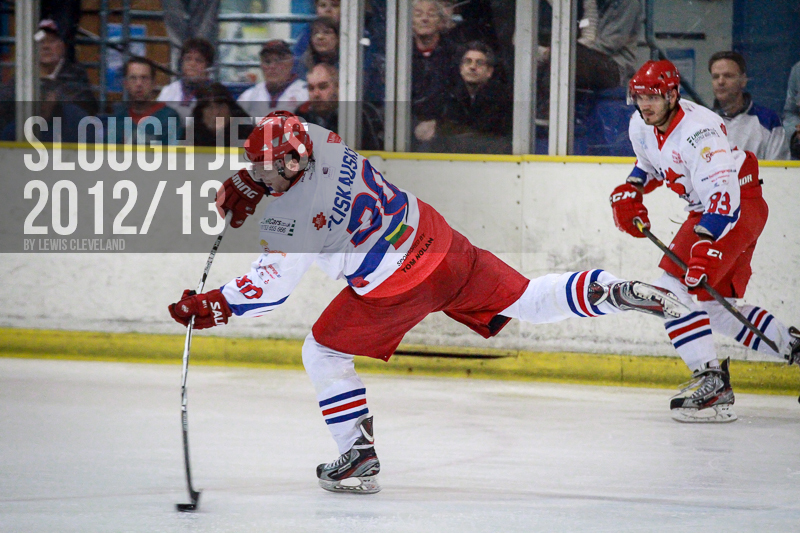 Doug Sheppard called Slough’s time-out and within 10 seconds Darius Pliskauskas had pulled back a goal. Ryan Watt kept Slough in the game with a goal at 38.16 making it 6-5. 122 seconds into the third period Tom Carlon netted a powerplay goal to level the score and Calder later completed his second hat-trick of the season at 50.19. Basingstoke continued to play a goal down and at 59.45 called their time-out. The remaining 15 seconds Slough defended the 6 on 5 while Basingstoke played with the empty net and Slough took full points. Slough welcomed Manchester to the Hangar a couple of weeks after their road trip to Altrincham with league and cup points up for grabs. The first period see-saw set the scene for the game ahead as Slough and Manchester exchanged advantage through the game. The visitors scored first through Marcus Kristofferson at 5.35 just 25 seconds after they’d killed their first penalty. Manchester’s second penalty was also killed but just 8 seconds after the return to full strength Paddy Ward scored their first goal at 13.57. Back out for the second starting at 1-1 the teams kept exchanging their advantage. Darius Pliskauskas made it 2-1 at 27.33 but Pavel Gomenuik levelled with a powerplat goal at 30.46. Doug Sheppard then put Slough back ahead with a strike at 33.08 but just 15 seconds later Tony Hand levelled again at 33.23 and the score stayed locked at 3-3 at the second interval. Manchester finally managed to break clear at 51.26 after the engineered a t 6 on 5 situation while Slough had a delayed penaty and James Archer converted. Curtis Huppe converted a powerplay to make it 3-5 at 57.51 but Slough pulled Gregg Rockman for the empty net and took advantage of a 6 on 4 opportunity with Slava Koulikov scoring with 29 seconds remaining. Slough kept with the empty net but Kristofferson put the puck in the empty net and completed the 4-6 win. Slough made the journey up to Milton Keynes to face the only undefeated team in the league. Slough took to the ice and dominated the game from the opening face-off. While the shots on goal were close it was the visitors who bossed the play and at 13.37 Jan Melichar opened the scoring. Peter Jasik doubled the lead at 18.04 and with just 17 seconds left in the period Sam Waller made it 0-3. If the first period hadn’t swung the result Slough’s way the second period sealed the points as a spell of 5.02 swung the game totally. Peter Poljacek netted at 28.00 and and again at 30.41 to make it 0-5. Blaz Emersic made it 0-6 at 32.01 and Dan Davies added another just 61 seconds later. Jasik netted his second of the night with a second remaining in the period and Slough were eight clear goals ahead at the second interval. MK had changed netminders in the second period and Alex Mettam kept a clean sheet through the final period and as Slough eased up the home team began to get some shots in on Gregg Rockman. With the Slough netminder 1.35 away from a shut-out Monir Kalgoum broke the clean sheet and despite Michael Wales getting the game’s last goal at 59.41 it was the visitors who finished up clear winners.